'Third Prominent Eyewitness' to the San Bernardino Shooting? Not So Fast. UPDATE 11/30/15 10pm Pacific Time: Idaho Sheriff Forced To Release Names of Two Killer Cops 13 Hours After Bombshell Expose Outed Them on LibertyFight.com!! There's plenty of documented evidence that the San Bernardino shooting is not what we're being told. Multiple eyewitness reported three shooters, along with several TV and print newscasts referring to the hunt for three shooters. There were also active shooter drills going on that the same time. Heck, even neocon government boot-lickers Pamela Geller and Rush Limbaugh, of all people, are asking questions about the third shooter. This is all great. However, this latest claim that is circulating on conspiracy sites about a 'third prominent eye-witness' who was called and told to change his story do not pass the smell test. "Now, a third prominent eye-witness, Chirs Nwadike, has stepped up to challenge the mainstream narrative. He recently told reporters he received a phone call from an unknown person around 7 p.m., on the evening of the shooting, who told him that he must say that Sayd Farook was the shooter. You read that right, he says that he was called and told to change his story and say that Farook carried out the attacks with his wife, even though that is very different than what he witnessed. "No it's not him [Sayd]. I told them about it. He's quiet. He doesn’t make any trouble." "He was just spraying bullets everywhere," Nwadike said. But the gunman was not Sayd, or his wife." In reality, Christopher Nwadike, a co-worker of Sayd Farook, was interviewed by the L.A. Times, Wall Street Journal, and many others where he admitted that he was in the bathroom when the shooting started and hid on the floor until rescue crews arrived to the bathroom. He never saw ANY shooter, much less his co-worker and his Muslim wife, or three tall white military men, or anyone else. Also, it's the very L.A. Times video of Nwadike that is circulating on conspiracy sites, as 'proof' of a false flag. Nowhere does either Nwadike or the L.A. Times claim that Nwadike saw the shooters, and they certainly never claim that Nwadike was called by some "secretive ominous guy" telling him to change his story. There's plenty of legit evidence here, let's not poison the well. The video they are referring to is below. First of all, he's jibbering in broken English, you can hardly understand what he's saying. And most importantly, he admitted numerous times, it's probably published in hundreds or thousands of newspapers, that he was in the bathroom when the shooting started and hid on the floor until rescue crews arrived to the bathroom. Of course the government does false flags but there is plenty of evidence, we don't need to make up witnesses or stretch the truth into something it's not. That will just serve to discredit those who want to teach the general public about false flags and black-ops. Here is a short excerpt from the Wall Street Journal, which interviewed Chris Nwadike. Chris Nwadike, a survivor of the deadly shooting in San Bernardino, Calif., was in the bathroom along with several other employees Wednesday when they heard shots. ...Not long after, during a break from the festivities, Mr. Nwadike was in the bathroom along with three other employees when he heard a sharp boom echo through the building. "The very first blast was a big one that woke up everyone that something was wrong," said Mr. Nwadike, sitting on his couch and gesturing with his hands as he described the previous day’s events. "When the first one sounded, I thought that something fell." A fellow inspector then recognized the sounds as gunfire and shouted for Mr. Nwadike and others to lie down on the bathroom floor. The co-workers huddled inside the bathroom could hear rapid bursts of gunfire and at times single shots, followed by screams and cries from the room where the party was held, Mr. Nwadike recalled. ..."I was thinking, 'Am I going to die or stay alive?'" he said, recounting how he and others stayed prone on the bathroom floor for roughly 10 minutes. The shots died down and the screaming grew louder, he said. They were still lying on the floor when the police came in to check on them." 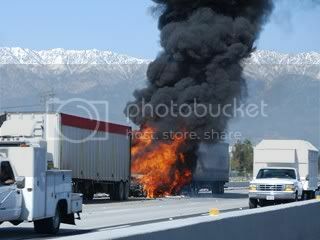 "Chris Nwadike, 62, of Rialto, environmental health specialist; uninjured. " The Los Angeles Times article 'A Christmas party with a trivia game - and then the shooting started' also notes that Nwadike was in the bathroom with his coworker Patrick Baccari when they heard the shooting begin. Remember, it's the very Los Angeles times video of Chris Nwadike that is circulating on conspiracy sites, with the insinuation that his 60 second video clip is somehow proof of a false flag. Nowhere does either Nwadike or the L.A. Times claim that Nwadike saw the shooters, and they certainly never claim that Nwadike was called by some "secretive ominous guy" telling him to change his story. Let's stick to real journalism, shall we? As we reported when the shooting occurred, witness Sally Abdelmageed, who works at the Inland Regional Center and witnessed the shooting in San Bernardino, was interviewed live via telephone by CBS Evening News the day the massacre happened. She repeatedly stated that "We saw three men dressed in military attire,"
The news anchor asks "You're certain that you saw three men?" She replied with a resounding "Yeah." That news video is here. Dr. Kevin Barrett has re-posted my initial article on the three white San Bernardino shooters, as well as added his own detailed analysis. He also posted a link to the radio interview he did with me last Friday. You can listen HERE. NOTE: The 'DISQUS' feature has been added to this site so you can leave your comments below, at the very bottom of this page. No login is required, you can post as a guest. Visit the LibertyFight.com GUN RIGHTS/ 2nd Amendment Archives here. 2007: Armed churchgoing woman took out mass murderer who sought to "kill as many Christians as I can"
PSYCHO AMERICA: DHS 'Use of Force Report' Admits Agent's "shots at suspect vehicles are taken out of frustration" involving "non-violent suspects who posed no threat"
To receive more articles such as these you can join the LibertyFight.com mailing list by contacting me here. or you can follow LibertyFight on Twitter here. A MESSAGE FROM LibertyFight.com: We are praying for the family of Jack Yantis and for his soul, may he rest in peace. This is a beautiful song called 'Blessed Are They.' Please also pray for the people who committed this atrocious killing, and for the people responsible for enacting justice in this matter. "Blest are they, full of sorrow, they shall be consoled." In reaction to our story, Ademo Freeman of CopBlock.org wrote: "Yesterday I posted an exceptional overview regarding the murder of Jack Yantis by two deputies in Idaho. The story was shared from LibertyFight.com and was written by Martin Hill. Today he emailed me again stating that the names have been released and that the below update was at his site. This goes to show the power of social media, public pressure and networking with each other to achieve a shared goal. IÃ¯Â¿Â½d like to thank Mr. Hill for his dedication to this story, in the interest of transparency and justice." William Grigg of the Pro Libertate blog wrote "Martin, congrats on compelling Zollman to disclose the shooters' names... All my best, Will." Dr. Kevin Barrett of Truth Jihad.com wrote: "Nice work, Martin!" Insanity Unbound: Infowars Characterizes "Dancing Israelis" Arrested in New Jersey on 9/11/01 as Arab MUSLIMS 11/27/15 - Washington Post DEBUNKS the "Muslims Cheering for 911" MYTH After their article was used as "proof"
The local Adams County, Idaho Sheriff Ryan Zollman, whose officers slaughtered Yantis, in the past has tried to portray himself as a 'patriot' pro 2nd Amendment type. But you can be the judge on this one. LibertyFight.com has uncovered official records from local Council, Idaho government meetings revealing that Sheriff Ryan Zollman justifies not only the seizure of local Idaho residents guns, but the sale of those guns. An obscure government document from an Adams County, Idaho Council meeting reveals that the Adams County Idaho Sheriff's Department participates in multiple classes given by the federal U.S. Dept. of Homeland Security. Family members say they don't know why deputies grabbed Jack Yantis and shot him. They say his wife was thrown to ground and handcuffed. Reports of a shootout are disputed. Be sure to visit DontWakeMeUp.org for full trucking archives. Ben Carson On Illegal Aliens: "Uh, They Could Stay"
In case you missed it, Dr. Ben "No American should be Allowed to Have A Semi-Automatic Weapon" Carson paid his obligatory visit to the 'Wailing Wall' wearing his yarmulke. Carson, the dim-witted glassy-eyed Israeli shill, has also said that the millions of illegal aliens "uh, they could stay." He's also said "Al Sharpton and I Have the Same Goals." I am not kidding he actually has said all of those things. He just changed his party affiliation to Republican six months prior to running for president. U.S. Government funding the very groups who are killing Christians July 14, 2013 Top Catholic Patriarch on record saying that Western Nations "bear responsibility for what is happening in Syria"
Venerable Archbishop Fulton Sheen on 'False Compassion': Ditch The Child labor Laws! Glassy-Eyed Dimwit Ben Carson Dons The Beanie 10/28/15 - In case you missed it, Dr. Ben "No American should be Allowed to Have A Semi-Automatic Weapon" Carson paid his obligatory visit to the 'Wailing Wall' wearing his yarmulke. Carson, the dim-witted glassey-eyed Irsaeli shill, has also said that the mllions of illegal aliens "uh, they could stay." He's also said "Al Sharpton and I Have the Same Goals." I am not kidding he actually has said all of those things. He just changed his party affiliation to Republican six months prior to running for president. Ben Carson On Illegal Aliens: "Uh, They Could Stay." Flashback: Black Civil Rights Pioneer Was "Intimate Friends" with David Duke, Opposed the "Elite Ruling Class"
New World Order Insanity: Rand Paul endorses Mitt Romney as "precisely the person I would want to turn around a failing business like our government"
Ron Paul on 9/11 conspiracies (in chronological order) Must-see. Mitt Romney Demands Removal of Confederate Flag in SC, "a symbol of racial hatred"
This "highly visible" holocaust memorial is appropriately sandwiched between the infamous Reichstag Building, The U.S. Embassy, and the Homosexual Memorial Museum. The placard in the video states, in part, "In August 1988, the journalist Lea Rosh and the historian Eberhard Jackel made a public proposal for establishing a "highly visible memorial for the murdered Jews of Europe" in Berlin. On 25 June 1999, after long and drawn out debates, the German Bundestag finally passed a resolution to build a "Memorial to the Murdered Jews of Europe" based on the design by the New York architect, Peter Eisenman. On 10 May 2005 the Holocaust Memorial - comprising 2,711 concrete stelar and a subterraneon Information Centre - was officially opened to the public. The exhibition provides information about the Holocaust and the "authentic sites of remembrance". Moreover, it honours the up to six million Jewish victims from throughout Europe." The Christopher Dorner saga has an eerie predecessor with many striking similarities, involving a 35-year old former police officer named James Beck. Police burned him to the ground inside a home during a standoff. Invoking Sandy Hook, California seeks 'Ammunition Purchase Permits' "for the sake of our children" December 29, 2012. The U.S. Department of Justice, California Highway Patrol, California State Senate, California Police Officer's Association, and the Navy Network Information Center have visited this article.